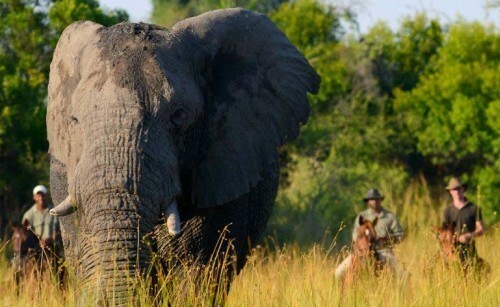 A horse safari in Mozambique is an unparalleled experience for those who love all things exotic, and who are looking for that post-card perfect paradise. 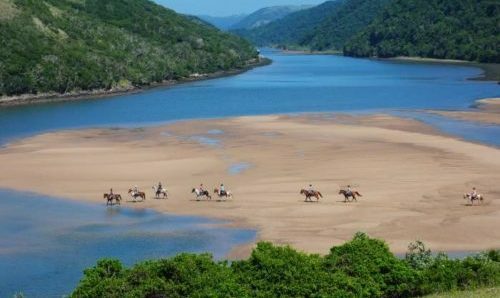 Experience thrilling beach canters, horse swims and exploring this wonderful country the way it should be done – from the back of a horse. 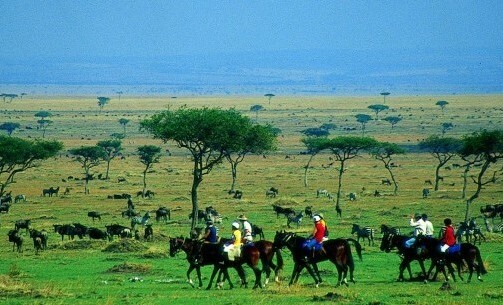 Perfectly intertwine a retreat into beach-holiday paradise with the adventure of an African horse safari. Stay in a beautiful coastal lodge, which boasts stunning views out across Bazaruto Archipelago bay, and indulge in the wonderful cuisine, restaurants – and of course those all-important cocktails – the area has to offer. You will have the exclusive and unique opportunity to ride on the enchanting Benguerra Island. 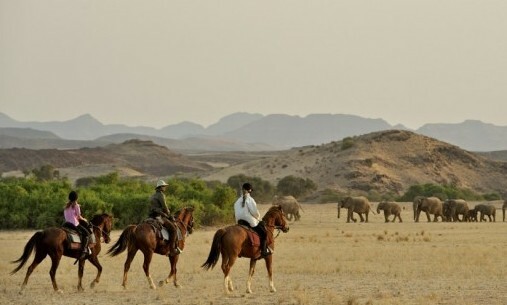 This riding holiday promises an unforgettable experience; fantastic horses and riding, unique boat trips, spectacular coastlines, delicious meals, local culture and stunning sunsets. Immerse yourself in the wonderful lifestyle, culture and energy of Mozambique; it’s a decision you won’t regret it. Vilankulo is a small town on the stunning coast of Mozambique, part of the Vilanculos District of Inhambane Province. The town acts as the gateway for visiting the nearby Bazaruto Archipelago, separated from the mainland by a narrow channel of turquoise sea. The area boasts spectacular beaches, crystal clear seas and excellent local cuisine, such as fresh seafood. Rich with traditional culture, staying in Vilankulo really allows you to immerse yourself in true Mozambique life. The 5 day Benguerra Island Ride excludes days 2,3 and 6. The 5 day Coastal Paradise Ride excludes days 3,4 and 6. Day 1: INTRODUCTORY RIDE. 2 hours riding After being met at Vilankulo Airport by either Pat or Mandy, your hosts for the week, you will be transferred to the lodge where you will have a chance to settle in. In the afternoon meet the horses and the staff at the stables. Try out a few horses in the arena, and once settled, head out for your first relaxing ride across those brilliant white sand beaches, to get to know your steed. The ride will take you through a variety of vibrant eco-systems; wide open beaches, incredible cliff top views, pristine dune bush and mangrove shoreline. For your first evening in paradise, enjoy a fresh seafood dinner served under the stars and overlooking the sea. Day 2: THE GREAT LAKE RIDE & CANOE. 3 hours riding. After waking up to your first African morning and delicious breakfast, mount up and head inland - following natural trails past African villages and large natural fresh water lakes. The area boasts spectacular birdlife with a good chance of seeing eagles, herons, harriers, rollers, pelicans and kingfishers. As you ride through the bush, past African farmland and rural schools, the old farm roads invite some faster riding, calling out to be cantered along as you head for the Govuro River. Upon the grassy banks of the river a delicious picnic lunch will have been laid out for both riders and horses, and you will be welcomed with an ice-cold beverage. 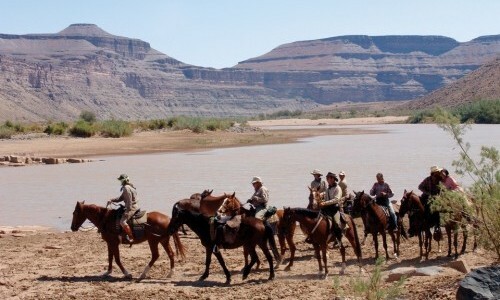 After a leisurely lunch, the horses will be taken home, leaving you to enjoy a guided tour along the river. The stunning Govuro River provides an unforgettable backdrop for your canoe trip. Paddle past lush river vegetation, spying native fish in the clear water and listening to the sounds of the African wilderness. As the sun sinks this evening, enjoy a relaxing sundowner sitting round the campfire and wait for the spectacular stars of the huge African sky to appear. For dinner, indulge with a sumptuous Mozambican BBQ. Day 3: CASA REX BREAKFAST RIDE AND MARKET TOUR. 1.5 hours riding Rising with the sun, ride out along the beach, heading north and passing through a small town to reach a wide open bay full of colourful dhows. A thrilling canter across the beach, passing local fishermen heading home, ends with a buffet breakfast at Casa Rex – Vilankulo’s most exclusive resort. Beautifully satisfied, you will be introduced to a local guide who will help you weave your way around the bustling and vibrant market and provide insight into the lives of the local people. You will then make your way back to the resort for lunch and an afternoon chill session by the pool. However, if you’re keen to keep active there is the option to enjoy a day of scuba diving, kite boarding or deep sea fishing at an additional cost. Dinner will be taken at Vila De Sonhos. Day 4: BENGUERRA ISLAND RIDE. 3 hours riding This morning an early start is imperative; you will be picked up from town by a dhow which will take you through the picturesque Bazaruto National Park to Benguerra Island. En route, as you spot for dolphins, turtles, rays and take in the stunning sea views, a packed breakfast will be served. Riding on the island is an extremely special and breathtaking experience; large sand dunes, freshwater lakes, endless white sandy beaches and excellent birdlife – often featuring large flocks of flamingos. Once you dismount, a fresh seafood lunch is prepared by your captain on board, whilst you sit back, relax and island hop to Margaruque. After lunch, grab some snorkel equipment and experience some of the best snorkeling in the world along a vertical rock drop off. However, if snorkeling isn’t your thing then take some time to wonder along the beach or work on your tan. As the sun sinks lower over the ocean, you will return to Vilankulo and enjoy a sumptuous meal with breathtaking views – another night to remember. Day 5: FISHING VILLAGE RIDE. 2 hours riding Today’s riding will begin at 11.30am, giving you a chance to enjoy a leisurely breakfast and morning swim before mounting up and heading out. Riding through the beautiful coconut plantations, you will reach Enrique's Fishing Village, where the local chief is waiting to welcome you. Take lunch in true Mozambican style; enjoying a refreshing coconut drink, fresh crab and tasting Matapa, a traditional Mozambique dish. In the afternoon, mount up and continue through the village, heading for the ‘Fingerprint of God’ – a viewpoint with stunning vistas over the archipelago. That evening, drive into town for dinner, picking from one of the many excellent restaurants the area has to offer. Day 6: BEACH & BUSH RIDE. 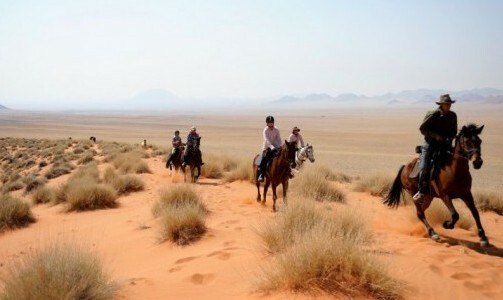 3 to 4 hours riding Day 6 promises a wonderful riding experience. Following the old coastal main road running parallel to the beach, you will cross a small river estuary and pass through some rural villages along the way. 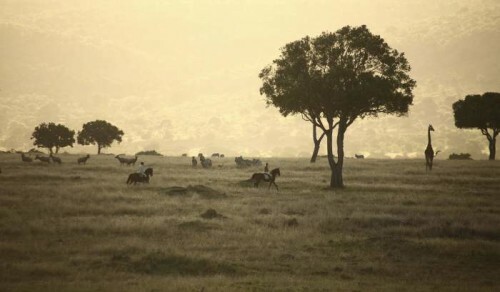 The terrain encourages long, uninterrupted canters through the coastal bush. After several hours in the saddle, reach a path leading down to the beach which offers stunning views across the bay. The pristine and empty beaches call out to be cantered across, and you can tick cantering on the beach in paradise off your bucket list. Return to the lodge in time for sundowners and enjoy a delicious meal at one of the local restaurants. Day 7: RED DUNE RIDE, NORTH BEACH. 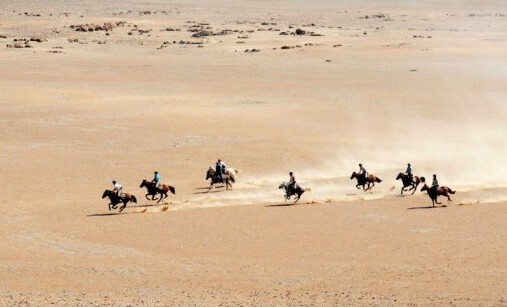 3 to 4 hours riding Following breakfast, drive to the stables and set off for a ride through the outskirts of town; before reaching the deserted sand beaches that lead to the Red Dunes on North Beach. 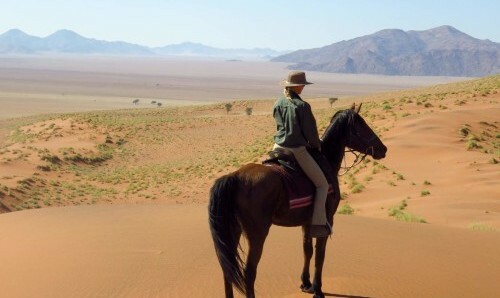 This is an exhilarating ride with ample opportunities for canters on the wide open beaches. You will climb the red coastal dunes and experience panoramic views of the iconic white sandbars and bright turquoise seas. A splendid seafood bonanza is on offer at the lovely beachside restaurant where you will stop for lunch. In the afternoon, stop at a local arts and crafts centre that supports the local community before heading back to relax by the pool or take a stroll along the beach. Spend your last night in a beautiful setting, reminiscing about what will have no doubt been an unforgettable week and enjoying a last delicious meal in paradise. Day 8: FAREWELL RIDE & SWIM After a relaxing breakfast, you will climb aboard for a last morning ride, bidding farewell to the spectacular coastline of unspoiled beaches and turquoise seas – an image that will stay with you forever. 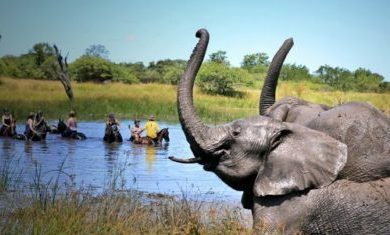 It would be rude to end your safari without giving your four-legged companion a refreshing dip in the ocean. End your trip by swimming with your horse, an unparalleled special experience and something you will, without doubt, both enjoy immensely! Once you’ve finished photographing and frolicking, there will be time for one more lunch before you bid a sad farewell to Vilankulo paradise and continue on your journey. The winter season is cooler and dryer, with only a very small chance of rain. When we say winter – it is still shorts and t-shirt weather and what most people would consider a great summer! In the early hours and late evening you might need a light jacket. The summer is the hotter and wetter season when it can occasionally rain but usually only for brief vigorous downpours before the sun then returns. In Vilankulo it is rare that it rains for long enough to spoil a riding day and despite the hotter temperature there is often a cool breeze along the beach. Please enquire for longer stay rates. In the room you will be given a fruit bowl, gift pack and the fridge will be stocked with water and cool drinks. Any personal spending money and any extra excursions or activities not included in the itinerary. Vila de Sonhos is an exclusive beachside lodge overlooking the Sao Sebastiao Peninsula and islands of Bazaruto Archipelago. This exclusive lodge is located on the beachfront. There are four villas, and each villa has two double rooms and two twin bedrooms, all of which have en-suite bathrooms. Each room is designed to offer stunning views and are complete with private balconies. There is also a comfortable lounge complete with Wifi & dining area, as well as outdoor braai area. There is a fully fitted kitchen with a personal chef who will treat you to delicious local cuisine throughout your stay. There is a swimming pool or, if you would prefer to take a dip in the turquoise waters of the Indian Ocean, there is a private entrance to the beach, which is just at the end of the garden.